Sea sickness and waves as high as five metres are making life difficult for all six teams on the first day of the second stage of Leg 4 from Sanya, China to Auckland, New Zealand. 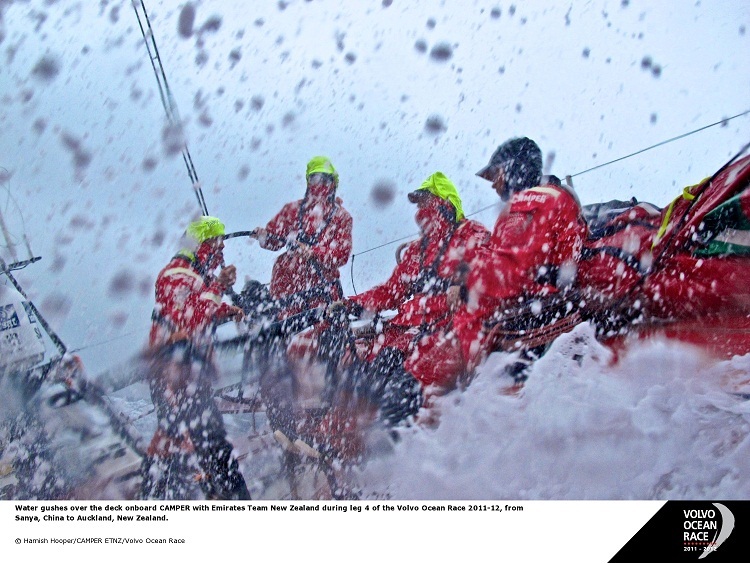 Conditions on board have been brutal as the crews struggle to rein in their Volvo Open 70s to avoid teeth-rattling crash landings off the backs of the monster waves left over from several days of gale force winds. A drifting start in the wind shadow of Sanya’s towering mountains belied the testing weather the crews found themselves in just hours later, after the wind and sea state quickly ramped powering them towards the Strait of Luzon at speeds up to 20 knots. On Abu Dhabi Ocean Racing, Media Crew Member (MCM) Nick Dana said the unavoidable and relentless slamming made for a near impossible working environment on board. "The airdrops we are experiencing off the backs of these sharp waves make it difficult to keep your feet below you let alone a sail or a steering wheel in your hands,” he said. "We’re currently blasting along at around 18-20 knots with a J4 and reef in. Even Abu Dhabi skipper Ian Walker, a double Olympic medallist, confessed to feeling the effects of the punishing sea state. Walker said the Abu Dhabi crew were not relishing the prospect of a fortnight-long battering but were settling into a normal offshore routine of grabbing sleep in between their four hourly watches. 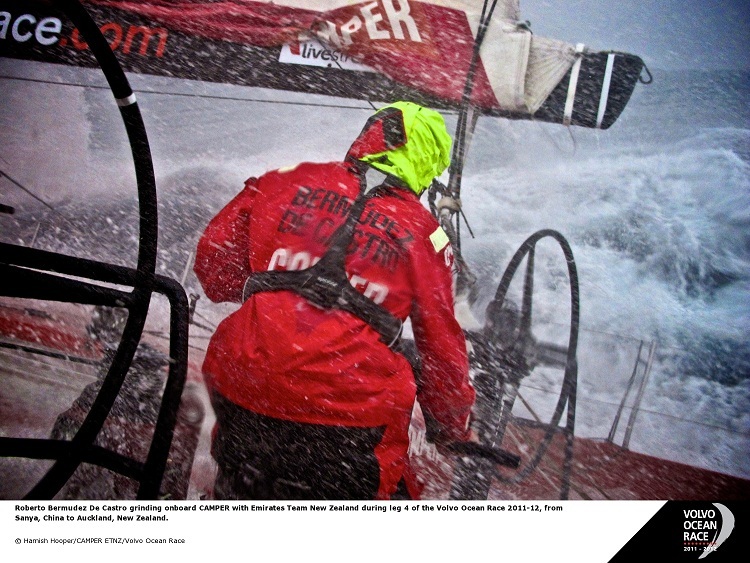 Race organisers split Leg 4 into two stages in order to prevent the fleet encountering conditions considered un-sailable in the South China Sea. Conditions were light and fickle for the second stage start at 2300 UTC on Sunday (0700 today in Sanya), all but wiping out the effects of the staggered start sequence from the Stage 1 coastal race less than 24 hours previously. Franck Cammas’ Groupama sailing team made the best of the early drifting to pick their way past overall race leaders Team Telefónica, skippered by Iker Martínez, and into the lead. 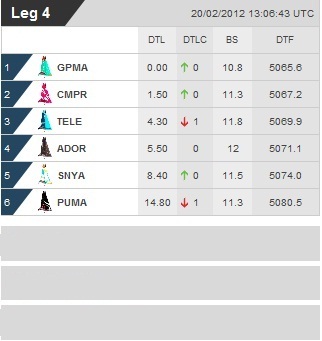 At 1300 UTC today Groupama had a lead of less than two miles over Chris Nicholson’s CAMPER with Emirates Team New Zealand, with third and fourth placed Telefónica and Abu Dhabi positioned furthest north just over a mile and a half apart. The near windless start had given CAMPER an immediate opportunity to sail round round the wallowing early starters. "We had to wait nine long minutes and 13 arduous seconds as Telefónica, Groupama, Abu Dhabi & Sanya all started before us,” said CAMPER MCM Hamish Hooper. CAMPER leave Sanya still second in the overall standings and Hooper says despite losing points to leaders Telefónica during the Chinese stopover the predominantly Kiwi crew have been re-energised by the prospect of a victorious arrival in New Zealand. "At times you feel like a block of cheese being rubbed up against a cheese grater, slowly withering you away physically and mentally, but the guys are resilient and focused, and it feels fantastic to finally be heading for home to Auckland. "Our short-term goal for sure is to be the first out of the Luzon Strait. No need to guess our long-term goal,” Hooper said. Ken Read’s PUMA Ocean Racing powered by BERG, who started almost 40 minutes after Telefónica, were still in sixth at 1300 UTC, 14.5 nm off the lead. 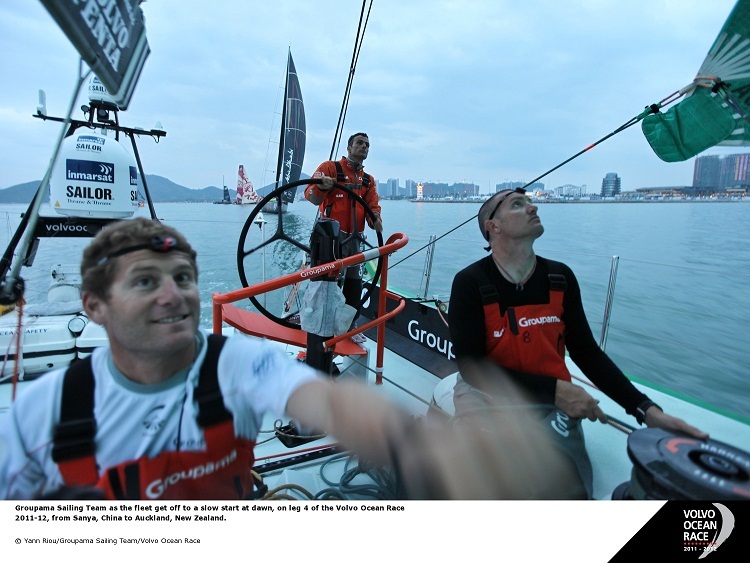 Mike Sanderson’s Team Sanya made a tactical break to the south of the main fleet and at 1300 UTC were fifth, 8.4 nm behind Groupama and averaging 11 knots. The six-boat fleet will take around three days to cross the South China Sea to the Strait of Luzon and are expected to complete the 5,220 nm second stage of Leg 4 to Auckland around March 8.